These settings help Revisr to communicate with a remote repository – most commonly, Bitbucket or GitHub. If you installed Revisr on an existing repository, Revisr will use your existing configuration for pushing to or pulling from remotes. Otherwise, you can configure the settings for your remote by going to Revisr -> Settings -> Remote. There are a few key settings here for automating your workflow with Git. Remote Name – Git automatically sets the name of the remote name to “origin” when you clone a repository or add a new remote. If you’ve changed the name from “origin” to something else, you can specify that here. Otherwise, leave it blank. Remote URL – This is how you’ll connect Revisr to Bitbucket or GitHub. These values may already be filled out for you if you installed Revisr on an existing repository. Otherwise, you can set this to either the SSH or HTTPS clone URL provided by Bitbucket or GitHub. Click here for instructions for finding the Remote URL on Bitbucket, or here for instructions on finding the URL from Github.IMPORTANT: If you’re using the HTTPS method to connect, you will need to provide your password in the URL as shown in the screenshot above. This will be stored in clear text in your .git/config file, so make sure that you take the necessary precautions to lock it down as described here. Using the SSH method to connect avoids this issue altogether, although you will have to generate an SSH key on your server and add it to Bitbucket or GitHub. You can read more about that here (the process is generally the same for both providers, but make sure when generating a key that you don’t use a passphrase so Revisr can push automatically). Automatically push new commits – Just like the name implies, this setting will make Revisr push commits as soon as they are made. Combined with the daily backup setting, this could be a real time saver! 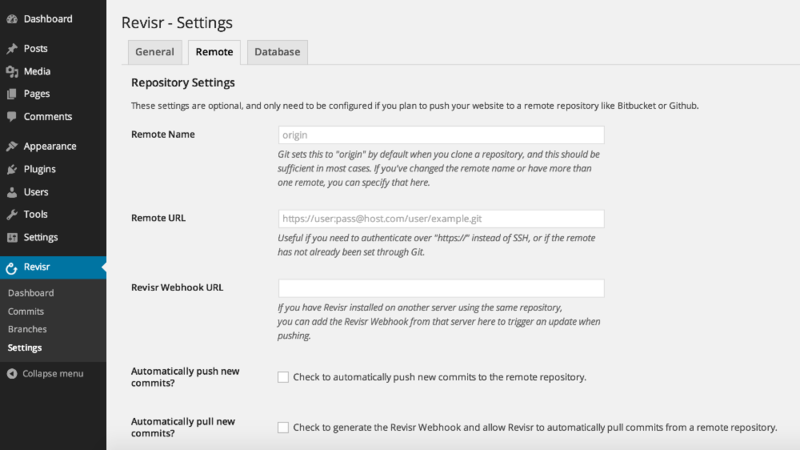 Automatically pull new commits – Checking this box will generate a secure webhook that can be added to Bitbucket, GitHub, or other instances of Revisr. When this webhook is triggered, Revisr will pull any pending commits from the remote repository. This is mainly helpful if you have multiple instances of Revisr on the same repository. You could add this URL to another instance of Revisr in the “Revisr Webhook URL” field, or even set it up as POST hook on Bitbucket or GitHub to automate pushes and pulls according to your workflow.